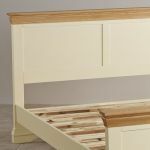 Full of character and charm, the Country Cottage Natural Oak and Painted Double Bed is handmade by expert joiners using only the finest cuts of solid hardwood. 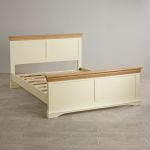 Featuring elegantly flared tops with panelled head and footboards, this stylish bed will complement modern and traditional homes alike. For an eye-catching contrast, the solid oak tops are left unpainted with only a simple coating of clear wax polish applied to enhance and protect the grain. We only use the finest materials in our furniture, which means no chipboard, no veneers and no MDF. 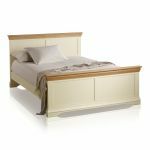 Don't forget to check out our range of quality mattresses, all of which are designed to complement our beds perfectly. This bed has been designed with minimal home assembly needed to aid in delivery to your home. 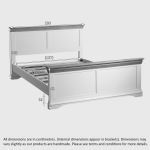 Full instructions will be provided to ensure the assembly process is straightforward.